On the run and looking for a way to save Earth from an army of kids imitating supervillains, Robin and Superboy have been joined by a young Green Lantern recruit in an attempt to stop the villains. Unfortunately, this led them to a prison world where they were trapped and separated. Now, back together, the Super Sons and their new ally use a teleportation device to escape the prison world. Where they land is not what they expected at all, but they end up with another new ally that helps even the odds on this strange, new world. 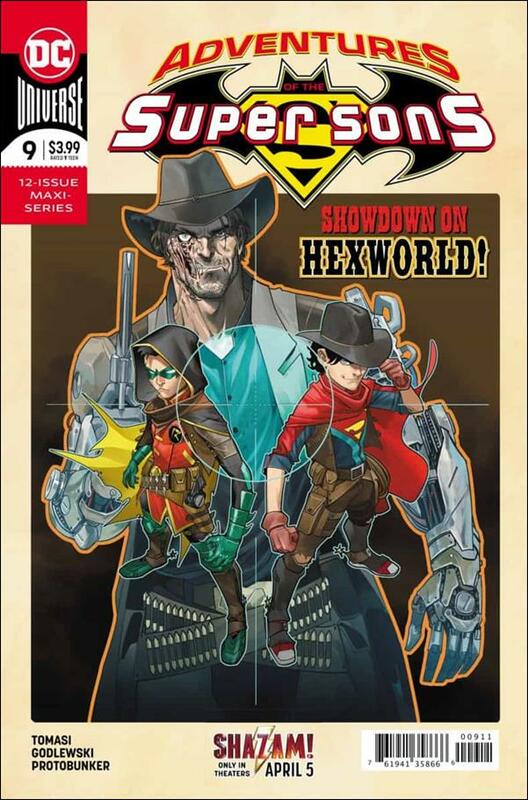 When the Super Sons literally drop into this new world, they land on a group of aliens dressed like cowboys. As they pull themselves up, they realize that they are on a wild west planet. They look up and see who the cowboys were pointing their guns at: Jonah Hex. The young heroes explain their situation to Hex, who then tells the boys that he will help them reach Earth. The three heroes then begin a trip with Hex that lasts a few days. The four of them ride across the planet on horseback and reach a spot to camp before reaching the ship they need. As the four of them talk, Jonah tells them that he can’t come with them, because he was programmed to stay on the wild west planet and never leave. Despite the protest of the young Green Lantern, Hex stands his ground. The next day, the four of them arrive at the terminal where the ship is. While Robin and Superboy separate from Hex and Lantern to deal with the guards, Lantern tries one last time to get Jonah to come with them. Hex once again refuses, forcing the Lantern to knock him out. While Robin and Superboy are successful at dealing with the guards, once they reach the ship, they are attacked by a much larger, more dangerous guard. When it seems that Superboy may be in serious trouble, he is saved last minute by Jonah Hex. Lantern was successful in breaking Hex’s programming, essentially freeing him from his entrapment on the wild west world. The four of them climb on board the ship and set their path straight for Earth. I loved this issue for so many reasons. For one, the dialogue between Damian and Jon was spot-on. With so many different ways that Damian is being written right now, sometimes I forget what he NEEDS to sound like. However, Super Sons hits the mark, showcasing Damian in the exact way he needs. Not only is the writing of Superboy and Robin spot-on, they brought in Jonah Hex. Hex hasn’t been seen much at all in a while, so seeing the cyborg outlaw back got me excited from the moment I saw the cover. Now that he’s free of his trap on the wild west planet, I really hope he has a major role in the series in the final three issues. This is, without a doubt, one of my favorite books right now. The writing is great, the art is great, the series itself is just great. Do yourself a favor and read it.